Virgil and Rebecca of Dayton have joined the ranks of foster families who fell in love with their foster dog and couldn't bear to let him go. White and red Braska Bernie is now known as Barney. He's sweet and gentle and a quick learner. He also really likes female greyhound Zelda, and more importantly, she likes him too and gave her vote of approval as she's showing in the photo. 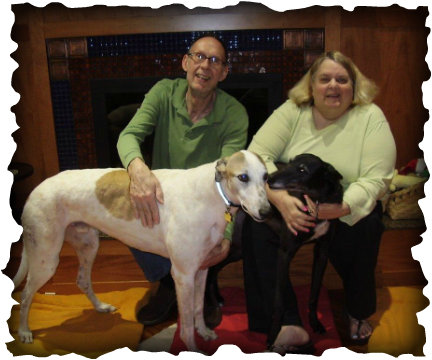 This family has had greyhounds for years and Barney could not have landed in a better place!